A date to put in your diary, Tuesday 21st July 8pm at Dynamic Rock Swansea climbing centre. I’ll be putting together pictures and stories from the time I spent solo travelling in parts Central and South America. WARNING: MAY INDUCE FEELINGS OF WANDERLUST AND QUITTING YOUR JOB! Starting my adventures off in Cuba, where the potential for rock climbing has only just begun, one day we take a horse and cart to the crag, and for the return journey an 1950’s stunning American classic car. In Panama a pocket of adventure tourism is adding to a thriving economy, where I met the first ever Panamanian rock climber. Next to avoid the guerrillas troubles in the jungle of the Darien gap, I join 25 other backpackers and sail through paradise islands to get into Colombia, after being left behind on a desert island with a small indigenous family. Forget the misconceptions you have about Colombia, I planned on 21 days in this country, and finally left after 70 days still wanting more. In the foothills of the Andes, in the trekking capital of Peru I learn a new skill, trying to climb at over 3500m. 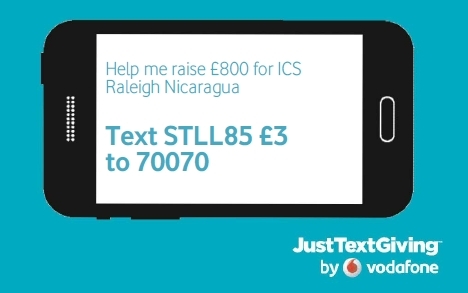 All money will go towards my fund raising goal of £800 for Raleigh International, where in September with your help I will travel to Nicaragua and work for 4 months as a volunteer team leader in a poor community on a Water Health and Sanitation project. Dynamic Rock have kindly provided the venue for free, so why not come in for a climb before the talk starts at 8pm? Donate £3 minimum here ->on my Just Giving page include in your comments that your reserving a seat. Alternatively text ‘STLL85 £3’ to 70070. £3 will then be donated straight to the charity. On receiving your reply back, click the link to register and add a similar comment that the donation is for a ticket. If your a UK tax payer, please consider filling in a few details for gift aid, the charity will get an additional 25% and it costs you nothing more! I will keep a record of payments ready for the night. Alternatively you can pay on the evening, but may not have a seat.